Heat pump loop systems may be converted to variable flow by installing a solenoid valve on each heat pump to stop the flow of water through the local heat pump (HP), when the unit is not operating. This allows the pump head to increase and the frequency inverter to modulate the pump speed to maintain a constant head (reduced flow). The result is a demand reduction and energy savings. Pressure sensor is connected to the refrigeration system and wired directly to the frequency inverter with a built in PID controller. This reduces material and installation costs. The existing motor may need to be converted to 3 phase. If the frequency inverter is to mounted a fair distance away, consider an output filter even though the motor is inverter rated. For sleeve bearing motors, the frequency inverter may be programmed to operate the motor at full speed for a few seconds to provide adequate lubrication of the motor. The booster pump and the export pump should have their own minimum-flow recycle valves. These minimum flows need to be maintained at all times -- either by a flow control valve or a restrictive orifice. A restrictive orifice is simpler; however, it will waste energy. I suggest flow control loops so that the flow is recycled only when needed. 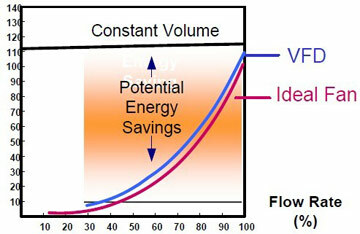 If flow above the minimum rate is required and the economics allow, use frequency inverters to reduce energy consumption. The problems reported may be due to low seal pressure. Double mechanical seals require pressure above the pump discharge pressure. Otherwise, hydrocarbon will migrate to the seal system. Another symptom -- pump vibration at low flow -- may be due to improper alignment and cavitation. 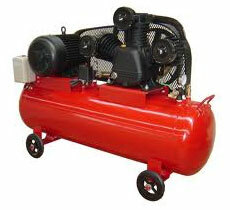 The same problems will appear with the new pump if the cause is not clearly established. Company A will save 55% of the energy costs by choosing a frequency inverter over outlet dampers and nearly 36% over inlet dampers. In addition, it may realize additional savings from the reduced equipment wear and tear that a frequency inverter provides compared to dampers. When frequency inverters are applied to Make Up Air fan systems, potential savings are realized by frequency inverter reducing the speed of the fan during low occupancy periods. The chart below shows the relationship between power and flow. These physical laws of fans show that a 50% reduction in flow requires only 12.5% of the available horsepower. For a 50 Hp , this means that only 6.26 Hp is required. 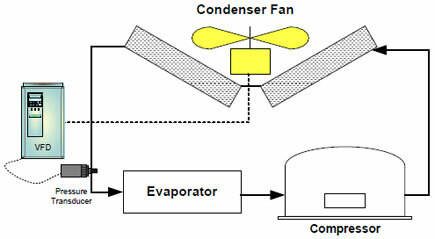 Additional energy is saved by the REDUCED amount of air that is required to be heated or cooled. Applying frequency inverters to Make Up Air systems together with a good overall control strategy can realize substantial energy savings with payback less than 2 years. Scheduling the Make Up Air can be as simple has programming the frequency inverter to several preset speeds that reflect the different occupancy periods in a building. The preset speeds are activated by time clock contacts or DDC control. The DDC control provides additional benefits which include frequency inverter control, mechanical heating & cooling control with temperature setback. 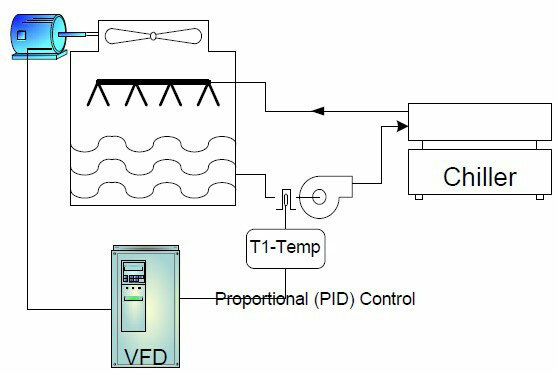 Implementing frequency converter to Chiller Condenser Water Reset can be easier achieved with PLC type DDC controls, which use cooling tower supply and return temperatures to reset the condenser temperature and to monitor the load on the chiller. Additional sensors can monitor chiller load, control fan speed, and insure that the condenser water temperature doesn't drop too low. Use the DDC controller to control the frequency converter & calculate the reset setpoint of the condenser water. To ensure flow of refrigerant and maintain oil movement within the chiller, a minimum pressure differential must be maintained between the condenser and evaporator. Too low of condenser water will hamper return of refrigerant and actually reduce chiller efficiency. Implement a frequency converter control strategy that optimizes the trade off between tower fan and chiller energy consumption. The frequency inverter control system should be capable of monitoring real time energy consumption. Building Automation System (BAS) Overrides should NOT be lower than the equipments minimum speed. Ideally the frequency inverters being controlled should be compatible and networked with the BAS. Actual energy usage, KW and power can be read directly from the frequency inverter without the added expense of interfaces. Consider the frequency inverters for retrofit applications. The frequency inverters are Metasys N2 and LON ready. It is possible to convert constant flow systems to variable flow with the use of frequency inverters. Figure 1 & 2 show two piping arrangements of constant flow systems. In these constant flow systems, bypass valves control flow but at a constant pressure and speed - which does nothing to reduce energy at part load conditions. Graph 1 shows a typical curve for bypass valve flow control. Review the systems pumping charts and system curves. If possible develop/measure your own system curves. Be sure to review or measure the systems static head. Review the type of valves. Three-way control valves may be converted to two way (see Figure 3). The existing 3 way valves  ideally should be equal percentage, and be able to control with the added pressure they will experience. If in doubt, 2-way valves may need to be installed. Differential pressure sensor(s) need to be installed. The number and location of the sensor will depend on the piping system. These sensors would directly control the frequency inverters on the pumps. Review to determine minimum flow requirements for the equipment (boiler & chillers). A new bypass arrangement may need to be installed to maintain the minimum flow requirements.